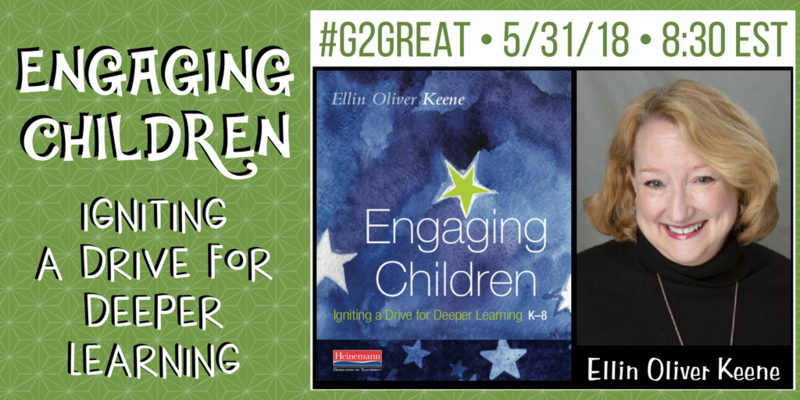 May 31, 2018 was a special night on #G2Great when Ellin Keene joined our chat as a first-time guest host. Like many educators across the globe, I have admired Ellin’s work since 1997 when she collaborated with Susan Zimmerman in Mosaic of Thought: Teaching Comprehension in a Reader’s Workshop (Heinemann). This week, we gathered together in a Twitter celebration of Ellin’s new professional masterpiece, Engaging Children: Igniting a Drive for Deeper Learning K-8 (Heinemann, 2018). To say that a buzz of excitement has revolved around the publication of this remarkable book and our much advertised #G2Great chat would be an understatement. This blissful wide-awakeness brings to mind wonderful images of children engaged in the joyful throes of learning, enraptured in a state of being where they become so captivated by a book or learning experience that they can willingly linger in emotion charged moments within quiet solitude or lively conversations in the company of others. Ellin suggests that our best intentions to motivate children may have fallen flat. In pondering that possibility, we can all draw upon our own memory of a time when we watched children passively go through the motions of surface level learning fueled by little more than compliant obedience. Contrast this view with children immersed in the deep engagement Ellin describes and it would be hard to argue that our best intentions have indeed gone awry for too many children. The question then becomes how we can create the conditions that would nurture the cognitive and emotional engagement Ellin captured so beautifully in Engaging Children. This kind of engagement is only possible when we acknowledge that students truly do desire this intense state of being and that we are confident that they are quite capable of achieving engagement under the right conditions. Only a cover to cover read of Engaging Children can possibly do this topic justice, so I know that the book stands alone on its own merit and therefore does not need my review. Rather, I would like to revisit and reflect upon her chat tweets as an extension of some of the essential features Ellin details in her book. It is my intent to use her words as a thread to Ellin’s wisdom. As we work toward achieving the highest level of engagement possible for all students, we can begin by keeping these eight big ideas that will nurture, celebrate and elevate engagement. Ellin shares a wonderful example of recalling and sharing her own engagement story about an airplane landing that was admittedly squirm worthy for this fellow flyer. She uses her story to illustrate the value of drawing from our experiences as a model for engagement. 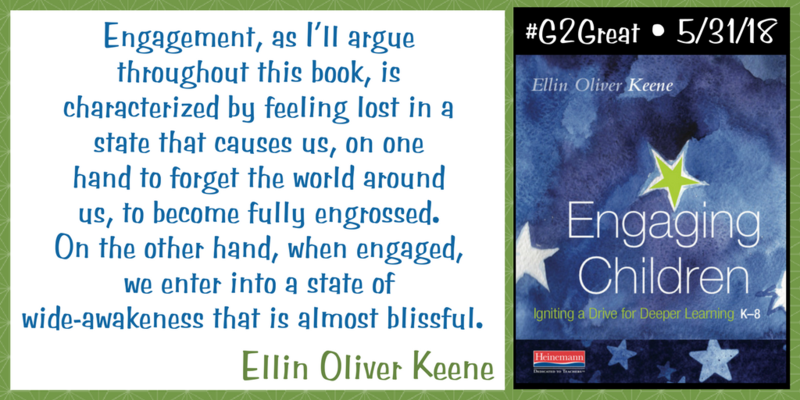 Our #G2Great chat is another example of this kind of personal engagement since Ellin immersed herself in a conversational form of blissful wide-awakeness Twitter style. I was mesmerized by how readily she conversed with fellow #G2Greaters considering that she is relatively new to the chat arena. If we want our students to understand what engagement looks like, sounds like and feels like, then we must become more engagement aware and then turn a spotlight on our experiences by sharing a time when we were spellbound by the very enthusiasm we hope for our students. But simply sharing our stories with students as models is not enough unless we can use those stories to build a bridge from teacher to student engagement. Children are hungry to have these experiences and so we invite them to share moments when an experience beckoned them to engage in a deep and meaningful way. We do this not as an obligatory act of probing but out of genuine curiosity for our students’ experiences at home or school so that we may create the opportunities, resources or designs that would incite the kind of engagement they deserve and avoid those that would extinguish it. If we are willing to view engagement from their very wise eyes and allow them to share the experiences, we can give them a language for having rich conversations – language that is brilliantly nestled in Ellin’s Four Pillars of Engagement. While engagement conversations with children can enrich future engagement opportunities, our noticings allow us to maximize those opportunities over time. When we make room to be intentionally present in learning moments, we give ourselves permission to enjoy the view. Kidwatching allows us to quietly fade into the background so that we can maintain a view from the sidelines to notice how students interact with the resources and experiences we offer and with each other. Quiet professional ponderings afford us time to soak in what we see without judgement in order to understand possible next steps. These thoughtful choices are guided by what we know about students and can dramatically alter their engagement in the future. I am so intrigued by Ellin’s idea to position ourselves in the room for varied perspective. Throughout the chat and Engaging Children, Ellin makes it clear that perfection is not the goal of engagement. Knowing all the answers so that we may carefully plan our day without leaving room to change course can cause us to miss signs along the way that could lead to real opportunities. Ellin asks us to invite students to generate passionate questions as a pathway to engagement rather than allowing engagement to stagnate when we merely view it as a question and answer process. Trust implies that we are prepared to be surprised by their responses so that we can celebrate the passions that are sure to lead us in new engagement directions. The goal student engagement is always to keep our sights on turning this process over to them. We model, discuss, understand, share, and support so that ultimately we can relinquish the responsibility for engaged learning to students. I love Ellin’s reminder to step back and her acknowledgement that this can be challenging. But when we trust our students, we willingly put them in the engagement driver’s seat and allow passion to be the fuel that propels them forward. Engagement is not a school strategy but a life strategy so we approach this critical topic so that students will carry those ideals with them long after they leave our four walls. I recall returning to this wonderful phrase again and again throughout Engaging Children because in so many classroom there is rarely a celebration of the WE that brings us together as a community of learners. I love the idea of courageous conversations where we can create a gathering space for students to come together and share their thinking. This collective thinking is about so much more than who they are as individuals as we celebrate who they are as humans. These conversations will be the inspiration for even deeper engagement as it invites them to create a shared passion trail to new learning possibilities in the future. At no point during my enthusiastic exploration of Engaging Children did I ever feel that Ellin was handing us a recipe tied to a carefully crafted list of ingredients that we would dutifully use in a checklist view of engagement. She reminds us that we each need the books and resources that will entice and excite the learners in front of us rather than disseminating a preselected lists of books. She reminds us to personalize our selections while taking our students interests and passions into account and even engaging them in this process. The final tweet is one that I did not recall reading in Engaging Children and yet I realized that it is really a concept that is intertwined across the book. In the hustle and bustle of teaching, it can be easy to view the engagement process as a race to the finish line. And yet Ellin asks us to slow down our pace so that we call allow students to truly live in the spirit of engagement as Ellin defines it. Giving children space and time to think affords opportunities that will allow that thinking to take shape in the company of others through varying viewpoints. This seems to me to be a critical feature of true engagement. As I look back at these big ideas inspired by Ellin’s hour on #G2Great, I realize that each is a theme woven across the pages of Engaging Children. I am struck by the idea that this is the first book that has actually approached the topic of engagement in a way that actually feels authentically engaging in every sense of the word, both as a learner and a teacher. I encourage you to revisit these tweets and then find the trail that leads back to Ellin’s book. Have we become so overwhelmed by what we teach — checking off one standard after another that we have forgotten that engaged students are much more likely to retain and reapply that content? Do we believe that students can learn to fall into the state of awareness, focus, intensity, and joy that we value so much for ourselves? We are so fortunate that Ellin is leading the way to help our students fall into the state of awareness, focus, intensity, and joy and we happily go on this engagement journey alongside them. What a remarkable gift Ellin has given us all. Finally, I include Ellin’s words at the end of the chat simply because it made me smile! Mutual admiration my friend. Totally mutual!